Our group has created an exuberant design for our painting. 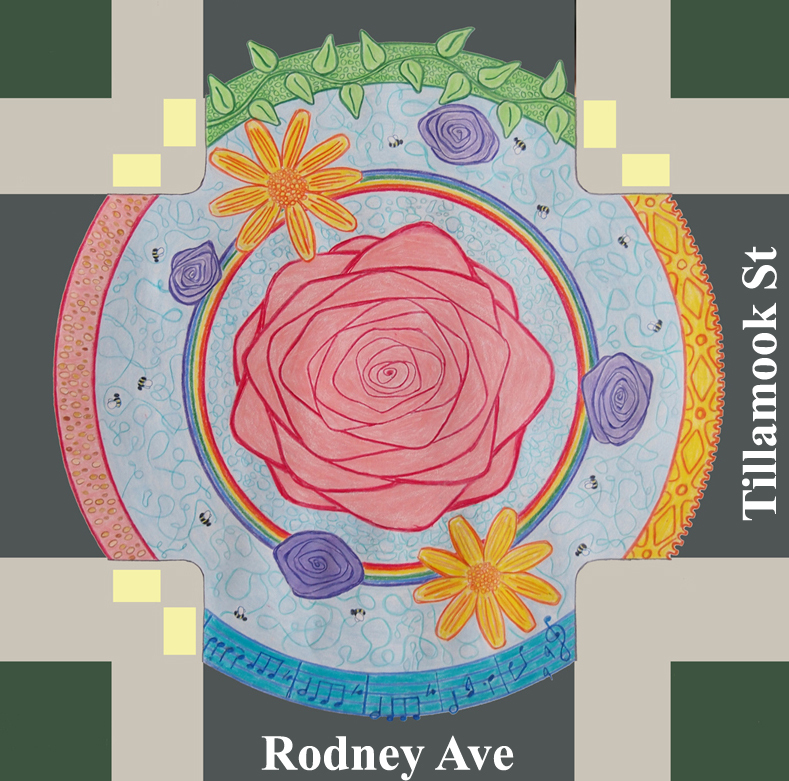 The floral center design represents growth and beauty in our community, which is located just north of the Rose Quarter. In the southern quadrant of the painting, musical notes remind us of our neighborhood’s vibrant jazz culture. The western quadrant will feature handprints of all those who come together to work on the painting. The northern quadrant represents the community gardens that have sprung up along our streets, as well as those we cultivate in our own yards. Finally, the eastern quadrant depicts the gears of the bicycles that flow through this intersection, which is the convergence of two greenways. This community-building project is intended to be an annual event. That means we will re-paint our design – or a completely new one! – next year, and the year after that. So come on out, meet your neighbors, eat some good food, and put your paintbrush to the street! For more information, or if you are interested in working with us, please contact Nancy – nancy.zimmermann@gmail.com, (503) 758-4856.